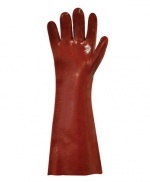 Red PVC Fully Coated Gauntlet Glove 22"
• Cotton interlock knitted liner. • Resistance to abrasion, tear and mechanical hazards. Kingfisher House, 11 Hoffmans Way, CM1 1GU.